The New York Times bestselling author of In Harm’s Way and Horse Soldiers shares the powerful account of an American army platoon fighting for survival during the Vietnam War in “an important book….not just a battle story—it’s also about the home front” (The Today show). On January 31, 1968, as many as 100,000 guerilla fighters and soldiers in the North Vietnamese Army attacked thirty-six cities throughout South Vietnam, hoping to dislodge American forces during one of the vital turning points of the Vietnam War. Alongside other young American soldiers in an Army reconnaissance platoon (Echo Company, 1/501) of the 101st Airborne Division, Stanley Parker, the nineteen-year-old son of a Texan ironworker, was suddenly thrust into savage combat, having been in-country only a few weeks. As Stan and his platoon-mates, many of whom had enlisted in the Army, eager to become paratroopers, moved from hot zone to hot zone, the extreme physical and mental stresses of Echo Company’s day-to-day existence, involving ambushes and attacks, grueling machine-gun battles, and impossibly dangerous rescues of wounded comrades, pushed them all to their limits and forged them into a lifelong brotherhood. The war became their fight for survival. When they came home, some encountered a bitterly divided country that didn’t understand what they had survived. Returning to the small farms, beach towns, and big cities where they grew up, many of the men in the platoon fell silent, knowing that few of their countrymen wanted to hear the stories they lived to tell—until now. 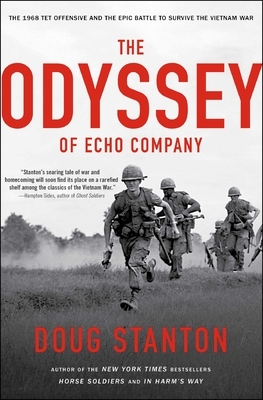 Based on interviews, personal letters, and Army after-action reports, The Odyssey of Echo Company recounts the searing tale of wartime service and homecoming of ordinary young American men in an extraordinary time and confirms Doug Stanton’s prominence as an unparalleled storyteller of our age. Doug Stanton is the author of the New York Times bestsellers In Harm’s Way: The Sinking of the USS Indianapolis and the Extraordinary Story of Its Survivors and Horse Soldiers: The Extraordinary Story of a Band of US Soldiers Who Rode to Victory in Afghanistan, which is the basis for a Jerry Bruckheimer–produced movie by the same name, starring Chris Hemsworth and Michael Shannon, to be released by Warner Bros. in 2018. He attended Hampshire College and the University of Iowa Writers’ Workshop. His writing has appeared in The New York Times, The New York Times Book Review, Time, The Washington Post, Men’s Journal, The Daily Beast, Newsweek, Esquire, and Outside, where he has been a contributing editor. Stanton is a founder of the National Writers Series, a year-round book festival, and lives in his hometown of Traverse City, Michigan, with his wife, Anne Stanton, and their three children, John, Katherine, and Will.